What's wrong with Leo Messi? Leo Messi has 29 goals this season in 29 games. He has also distributed 17 assists. At 31, his impact on both the development of the game and the definition continues to be total in Barcelona. So much so that the team of Ernesto Valverde pays the consequences of his extreme dependence now that the physical problems have limited the performance of the Argentine. The null activity of the Brazilian Philippe Coutinho , comfortable in the irrelevance, the orphanhood shown by Luis Suárez when he can not find the association with his best friend in the dressing room, or the strange role of Kevin-Prince Boateng , a temporary worker who has not come back from his debut as a starter in the defeat 'copera' in the Pizjuán, have undressed the cracks of the azulgrana set. After the tie saved by Ter Stegen in San Mamés, there are already three consecutive matches (Valencia and Real Madrid in Cup) that have finished in tables since Messi suffered the blow that contracted his right thigh on 2 February. Ernesto Valverde, and despite the requirement of the calendar [after the visit of Valladolid, will play back to the Champions League in Lyon, go to Pizjuán and face Real Madrid twice at the Bernabéu], rejected the possibility of granting a complete rest to Messi. Annoyances that never led to medical, but have minimized the front. Valverde allowed La Pulga to conclude that duel in front of Marcelino's, despite the fact that he could no longer take risks in the accelerations. In the first leg of the Copa semifinal against Real Madrid, Argentina was not a starter. But he did show up in the last 27 minutes, even if it was to threaten his presence . The doubts continued until the same Sunday in San Mamés, where Messi not only appeared at the beginning, but played the 90 minutes. Given that Arturo Vidal and Rakitic did not produce for the axis, and Coutinho took refuge in the lime, it was up to Rosario to lead again. And he paid it failing up to 15 passes. As much as his team had a week of rest ahead of next Saturday's match against Valladolid, Valverde preferred to keep him on the field. It is the circumstance that Messi has been able to take more breaks this season than in the previous ones. Especially because he chose to take a break in the Argentine team after the disappointment of the World Cup in Russia, or the fracture in the elbow that made him lose five games between late October and early November. In total, the 'ten' has played this campaign 2,301 minutes. He is only the seventh player who has participated in the squad, behind Luis Suárez (2,583), Sergio Busquets (2,623), Jordi Alba (2,667), Ter Stegen (2,700), Rakitic (2,720) and Piqué (2,880). 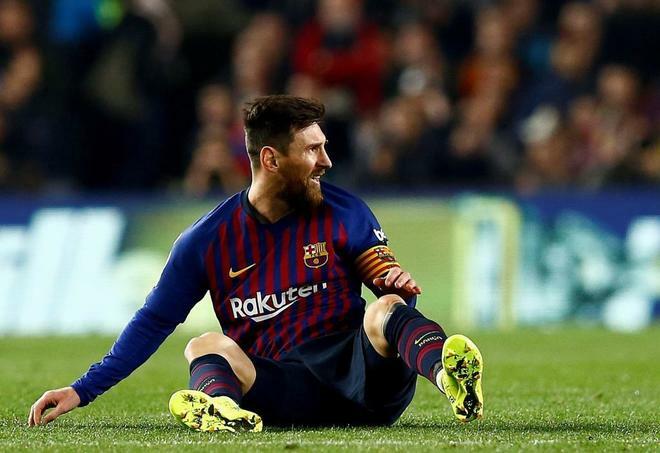 A week before the start of the Champions League round of 16 match against Olympique Lyon, Barcelona has no choice but to sigh for the fortune of their franchise player. The nine continental eliminations of Barça in the 'era Messi' have a common denominator. All were rounds in which the Argentine did not score , neither in the first leg nor in the return. The crude dependence.